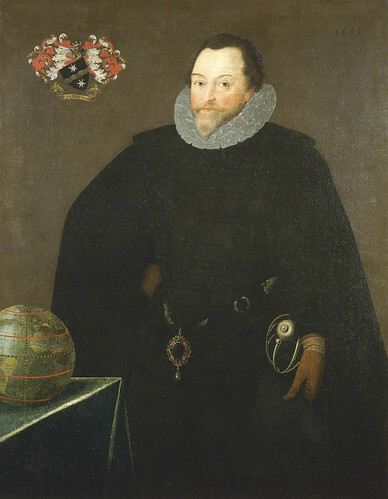 Sir Francis Drake, Vice Admiral (1540 – 27 January 1596), was an English sea captain, privateer, navigator, slaver and politician of the Elizabethan era. Queen Elizabeth I awarded Drake a knighthood in 1581. He was second-in-command of the English fleet against the Spanish Armada in 1588, subordinate only to Charles Howard and the Queen herself. He died of dysentery in January 1596 after unsuccessfully attacking San Juan, Puerto Rico. His exploits were legendary, making him a hero to the English but a pirate to the Spaniards to whom he was known as El Draque, "Draque" being the Spanish pronunciation of "Drake". His name in Latin was Franciscvs Draco ("Francis the Dragon"). . King Philip II was claimed to have offered a reward of 20,000 ducats (about £4m or $6m by modern standards) for his life. He is famous for (among other things) sailing around the world, returning to England in 1580.